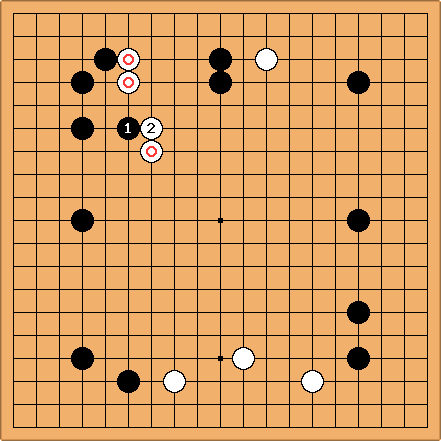 RiffRaff: I posted the first three Ja-Choong Soo quiz answers to the /Solutions page (since they seemed completely obvious even to a DDK like myself). Could probably use feedback on the other four below, though. RiffRaff: This was the least obvious Ja-Choong Soo move of the quiz, for me. White 1 certainly succeeds in reducing his own liberties, but I'm unsure of the continuation after this. RiffRaff: Black 1 seems to provide the best opportunity to simultaneously reinforce white and weaken the two black stones nearby. 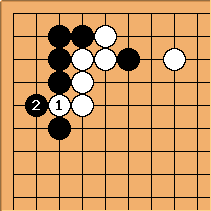 RiffRaff: Black continues to reinforce white's wall, while also walking right into a Hane at the Head of Two Stones. 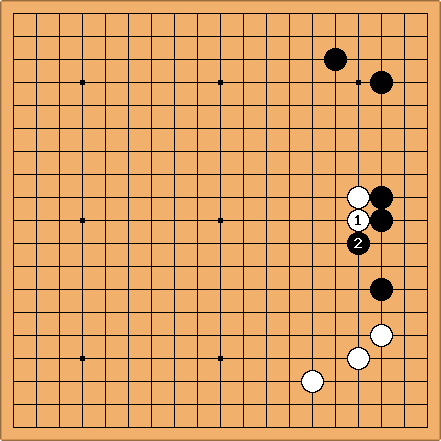 RiffRaff: Inviting black to Hane at the Head of Two Stones seems obvious enough. But is that the correct side for black to hane on afterward? Or is expanding from the corner enclosure more important?